In August, China’s internet population surpassed 800 million for the first time according to official government statistics. So what are all those people up to? Well, here’s an at-a-glance guide. Tik Tok also known as Douyin is one of China’s leading short video apps. Huya is one of the country’s biggest game streaming platforms and listed on the New York Stock Exchange back in May. Dating app TanTan is regularly referred to as “China’s Tinder”. Here’s what it’s like to use it in Beijing. 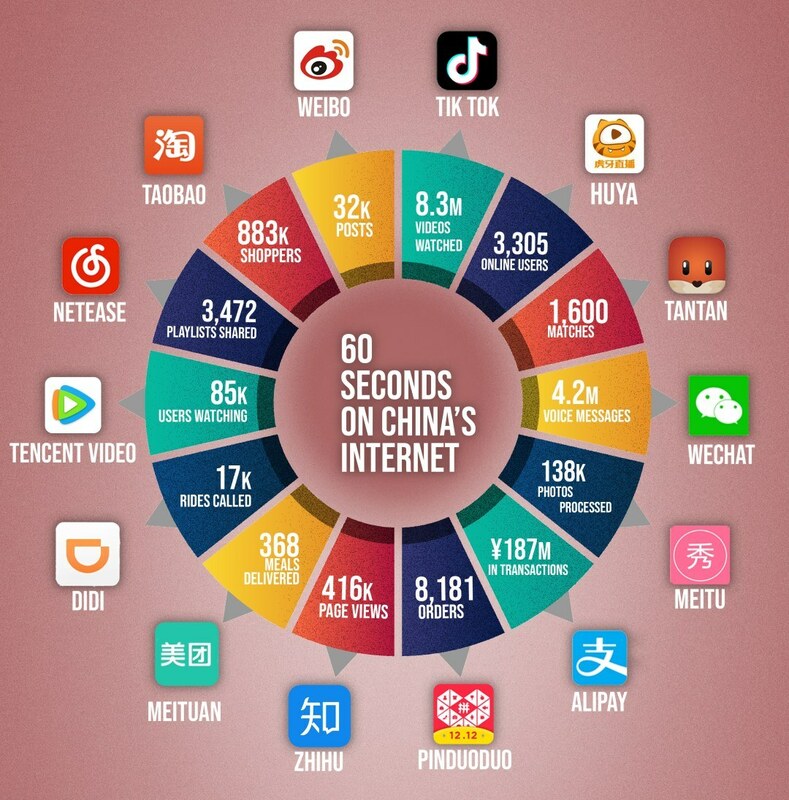 WeChat, probably one of the best known on this list, is Tencent’s marauding chat-and-so-much-more app. Find out more about what the app is so hard to kick here. “Beautification” app Meitu has been at the forefront of trying to help Chinese users get the perfect selfie, with a whole editing suite dedicated to changing the skin tone, erasing blemishes, and adding cutesy animal ears and noses to any photo. They also have a video equivalent. Alibaba’s payment app Alipay and its ubiquity is one of the reasons behind all those breathless “cashless China” articles that pop up on a regular basis. Group-purchasing, “social ecommerce” app Pinduoduo caused numerous headlines this summer thanks to a major IPO and accusations that it was propagating an image of China as the knock-off center of the world. Zhihu is a user-driven Chinese-language question and answer site, much like Quora. You may have seen Meituan in the news recently, thanks to the company’s Hong Kong IPO. The app has a sprawling range of functions, from food delivery to discount ticket buying. Here’s a complete guide to the “super-app”. Another Chinese company that’s been in the headlines of late, though for not-so-positive reasons, Didi is a ride-hailing app, frequently referred to as “China’s Uber”. Tencent Video is pretty self-explanatory; this is the Chinese internet giant’s video streaming arm. Gaming and media company — and pig farmer?! — NetEase runs a popular music-streaming service under its brand’s main name. Taobao is another name you probably know already. Either way, take a dive into the weird side of the shopping site right here. And finally on our wheel of Chinese internet firms, is Sina Weibo, the micro-blogging platform whose most obvious Western reference point is Twitter.